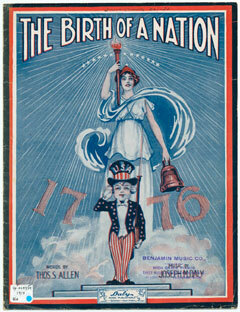 The Birth of a Nation by Thomas S. Allen and Joseph M. Daly, 1915. A patriotic piece typical of the years before the first World War. Courtesy of the Folger Library and the University of Maine. Used with permission. The Maine Music Box is an interactive, multimedia digital music library. Users may view images of sheet music, scores and cover art, play back audio renditions, and manipulate the arrangement of selected pieces by changing the key and instrumentation. The sheet music collection consists of approximately 22,000 pieces of historical and popular sheet music published and widely played from the mid-19th century until approximately 1990. The strength of the collection is in music published between 1920 and late 1990. Most of the music is written for voice and piano; a significant minority is instrumental, "parlor salon" scores written specifically for piano. Notable in the collection are early pieces by Irving Berlin and Jerome Kern, as well as music by other popular composers such as Victor Herbert, Percy Wenrich, Jean Schwartz, Paul Dresser, Ernest R. Ball, Gussie L. Davis, Charles K. Harris, and George M. Cohan. 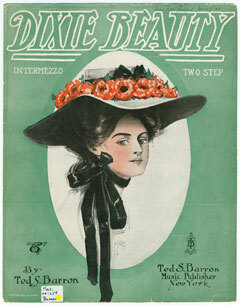 Dixie Beauty by Ted S. Barron, 1908. A simple, yet colorful design for this parlor piano piece. The collection documents the attitudes and tastes of American social life, popular culture and history through a variety of music types including blues music, sentimental, sacred and secular choral music songs, patriotic and political songs, songs from vaudeville and musicals, "Tin pan alley" songs, and songs from World War I. Also included are piano versions of marches, variations, opera excerpts, and dance music, such as waltzes, quick steps, mazurkas, polkas, etc. Cover illustrations represent an important, and in some cases almost unique, source of information for popular contemporary ideas on politics, patriotism, race, religion, love, and sentiment. Vocal, Popular Sheet Music Collection: over 16,500 pieces of popular American music representing the many vocal styles from the late nineteenth through the twentieth century. Parlor Salon Collection: over 3,000 scores composed, published and widely played from the mid-19th century (pre Civil War) until approximately World War I. It was performed in homes (parlors) and salons in intimate circles all over the world. Maine Collection: over 2,200 pieces ranging from 1845-1997 and includes keyboard, choral, vocal and instrumental music. Haywood Jones Collection: 28 original manuscript scores of primarily marches and school songs, composed by Haywood Jones for local high school bands in Bangor and New England. The Maine Music Box web site is <http://mainemusicbox.library.umaine.edu/>.